Entry to Madras HC will be frisked by CISF from Today : Registrar issues Public Notice. Registrar of the Madras High Court has issued a Public notice which said that every entry to the High Court is going to be frisked by the CISF personnel from today. The entry to the High Court will not be easy as it was till yesterday. The officers and staff members of the High Court are expected to enter the building through South Gate, whereas all other gates are open for Advocates to enter. The visitors and litigants should take entry passes and could enter only through the entry points located near the Court of Small causes building. Separate places are allotted for parking Vehicles of Advocates and officers and staff members of the High Court. The Public notice also says that every entry to the High Court will be frisked by the CISF personnel. Reportedly, he Central Industrial Security Force (CISF), already conducted a mock drill, two days before the HC deadline ends, as it wants to ensure a fool proof system is in place. 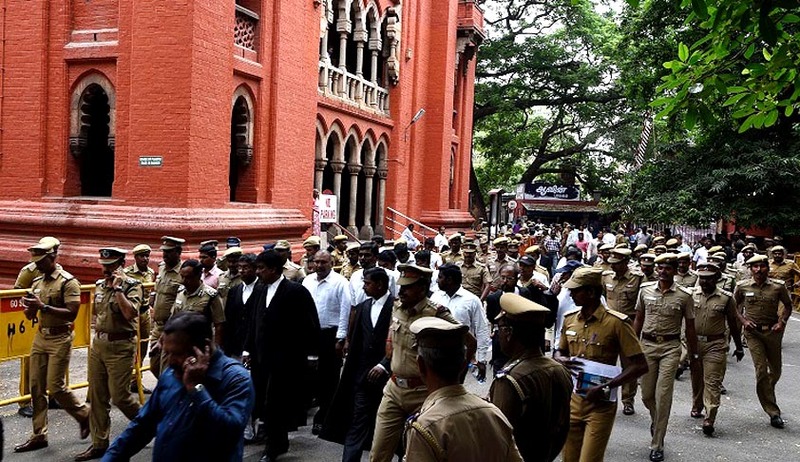 November 16 was the deadline fixed by the High Court for the CISF to take over security of the Madras High Court, and around 250 personnel, including 20 women, have already arrived. In September, a group of lawyers and ‘civilians’ had staged a sit-in protest inside the court hall demanding conduct of proceedings in Tamil. Pursuant to that incident, Chief Justice S K Kaul and Justice T S Sivagnanam had ordered the State government to provide CISF or a similar force’s security cover to the Madras High Court’s principal seat in Chennai and bench at Madurai. The First bench of Madras HC had observed “The judges must feel secure while administering justice and thus, proper security has to be arranged to prevent such incidents, which not only disrupt the functioning of the court but can result in security breaches when courts are concerned with sensitive matters, especially a court like the present High Court and its Bench”.